Description Can you make it through all 50 levels? Slide your purple sticky block through increasingly fiendish puzzles in this brain-bending game. Other blocks stick to yours whether you want them to or not, so you'll have to plan your moves carefully or end up in the middle of a large, unmovable clump of blocks! Deliver blocks to identically-colored locks to clear up space and pass through to the next level. 50 levels + 8 bonus levels + secret levels! 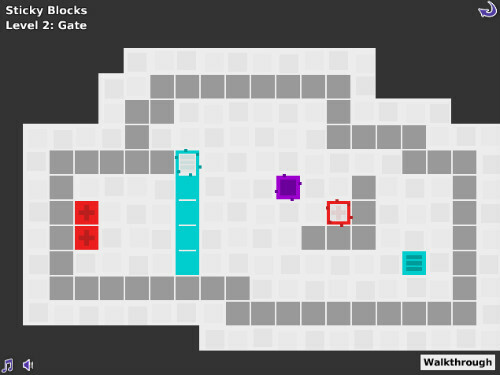 Use the arrow keys or WASD to slide the purple block around each level's puzzle. Other blocks will stick to your block AND any blocks stuck to your block. (If you get stuck you can press R to restart the level.) Deliver blocks to the appropriate lock to remove them from the level. Once all the locks in a level are unlocked, the level ends. Many levels allow you to collect additional blocks along the way to achieve a star rating. Star ratings unlock bonus and secret levels.